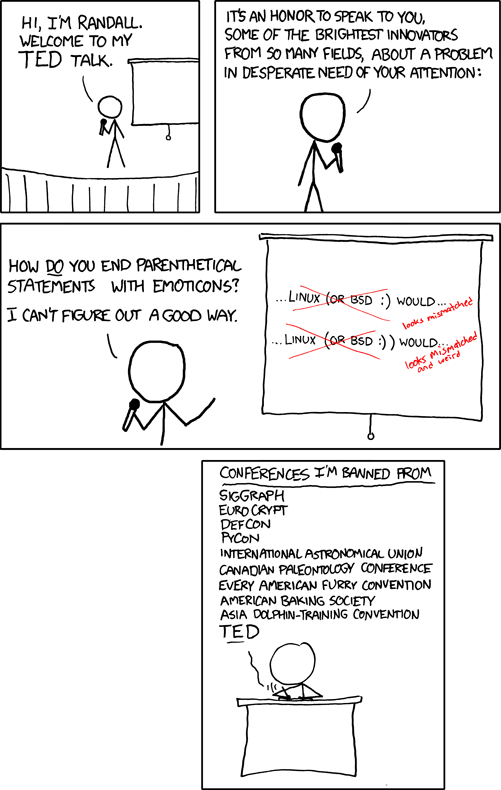 I know smileys are not part of written language (yet), and any questions about them are irrelevant to linguistics and are kind of not serious. So take my question with a smiley then. It bugs me every time I'm facing this situation: if an insertion in parentheses ends with a smiley, what should I do? A lot of insertions in parentheses (well, if it's not Lisp :) ) can be annoying. A lot of insertions in parentheses (well, if it's not Lisp :)) can be annoying. A lot of insertions in parentheses (well, if it's not Lisp :) can be annoying. I don't like any of the above. Any (clever) suggestions? I couldn't resist but post this! A lot of insertions in parentheses [well, if it's not Lisp :)] can be annoying. Though it's rather non-standard, it at least looks better. I'm sure almost any reader would understand it too. It’s the twenty-first century! We have a much better alternative to old ASCII emoticons: Unicode! A lot of insertions in parentheses (well, if it's not Lisp ☺) can be annoying. A lot of insertions in parentheses ( well, if it's not Lisp :) ) can be annoying. A lot of insertions in parentheses — well, if it's not Lisp :) — can be annoying. A lot of insertions in parentheses - well, if it's not Lisp :) - can be annoying. Normally a space should not be included between a parenthesis and the word it is adjacent to, but when using a parenthesis as part of a separate lexical element, spacing between the "word-element" parenthesis and the "syntax-element" parenthesis is very helpful to avoid confusion. Otherwise you might be sending a double-chin smiley and still have no closing parenthesis. The best solution, of course, is to avoid such a potentially confusing issue in the first place: grow a goatee, so that all your smileys can be of the form ":-)>". I would certainly, as a pedant, NOT drop the last parentheses (especially where I am not at the end of a sentence :) as it is ambiguous as to whether the parenthesed clause has completed yet, although I would readily admit a mid bracket smiley is particularly jarring and ugly). There should not be any spaces after the smiley, in the same way there is no space between a word and a closing parenthesis. In some messages sent through IM applications, a space is added after the smiley and before a parenthesis, as in some of these applications the textual smilies are replaced from a icon/image; in these applications, the double parentheses are used for a different smiley. This could explain why some people are used to add a space after a smiley, and before the following parenthesis. The extra space prevents unintended tokenizing of the second parenthesis. It bugs me when I write choose (A) or (B) and the text parser converts the capital B and the right parenthesis to a "cool shades emoticon". It looks clearer to me. Without the extra space it just looks like my keyboard hiccuped on the right side. I would suggest using a square bottomed smiley with a space after it. A lot of insertions in parentheses (well, if it's not Lisp :] ) can be annoying. Think about it this way, how would you do a frowny face? A lot of insertions in parentheses (well, if it's not Lisp :( ) can be annoying. A lot of insertions in parentheses (well, if it's not Lisp :() can be annoying. A lot of insertions in parentheses (well, if it's not Lisp :( can be annoying. A lot of insertions in parentheses (well, if it's not Lisp) :( can be annoying. A lot of insertions in parentheses (well, if it's not Lisp) :) can be annoying. Thanks to Unicode there's different widths of spaces, some of which may be more aesthetically pleasing depending on your preferences. A lot of insertions in parentheses (well, if it's not Lisp :) ) can be annoying. A lot of insertions in parentheses (well, if it's not Lisp :) ) can be annoying. A lot of insertions in parentheses (well, if it's not Lisp :)&hairsp;) can be annoying. Not the answer you're looking for? Browse other questions tagged punctuation writing parentheses or ask your own question. Is it acceptable to nest parentheses? How do parentheses work with colons? Punctuate a double question with the latter question in parentheses?